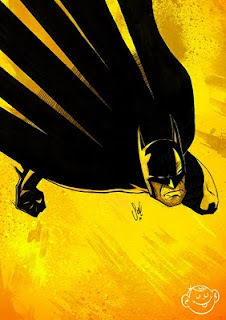 The Tanoshiboy Chronicles: Design & Illustration Blog: Who doesn't like Batman? Been watching some old episodes of the Batman animated series. Isn't it awesome? Even after all these years that series still holds up. I felt like drawing Batman and adding some color this time. In that series, the sky was always red at night, which I always loved. It was a huge contrast from Metropolis, which was always bright, even at night. I thought I'd try a different color to bounce Batman off of. I think the character works best when he looks like a big shadow or force, so I decided this was the way to go. Hope you like it. I welcome your comments. P.S. I'll give the original drawing away to the first person who tells me what the name of the reporter was in the original Batman film from 1989. Alex Knox was the reporter. I better win...i can add this to my Salvatier / Batman collection - momma's gotta pay for some college tuition! According to the time of the posting here and over on facebook...it would seem that Eliza is the winner. Sorry Scharrise and Denyse (that sorta rhymes), but maybe next time. Scharrise you are owed a sketch from last year so you will get that soon.